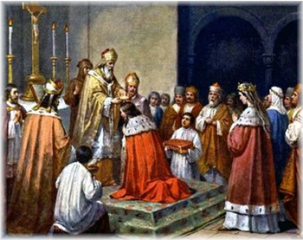 Coronation is a ceremonial introduction of the monarch to power. During this act a royal crown is symbolically placed on his head. He receives blessings from the church by oiling his hands by sacred oil. The coronation gradually became the most important event for the whole country. The festive ceremony was attended by significant personalities of the world, namely by the noted kings, church dignitaries and other important persons. Let´s go and see what the whole ceremony looked like. 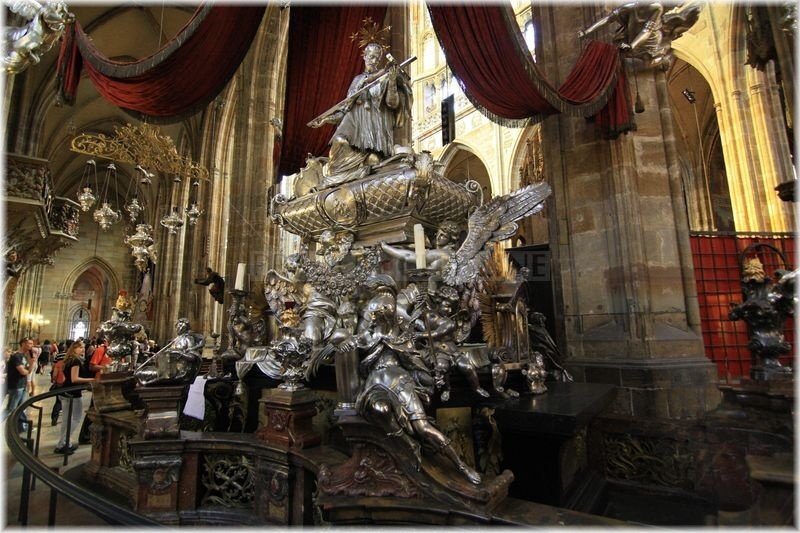 The most imporatant and most expected act was the coronation mass during which the new monarch received the St. Wenceslas crown and other coronation insignia. 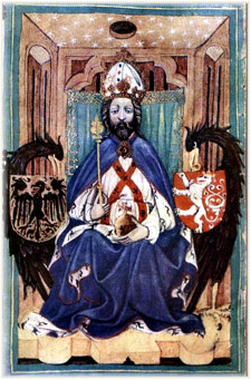 The term of the coronation was most often related to a significant religious holiday whereby the monarch received an imaginary religious patron. On the day of coronation the St. Vitus bells started to ring between 6 and 7 o´clock in the morning to announce the festive event. In the meantime the members of the court, aristocracy, spiritual representatives and the representatives of the most important cities of Bohemia started to gather in the courtyard of Prague Castle. It was already when the coaches with honourable guests were passing through the town gates. During the preparations the chief chamberlain was helping the king with putting on the festive coronation robe. The entrusted highest land officers with armed company gradually transferred the coronation jewels into the St. Wenceslas Chapel. After the preparations were ready the ceremonious coronation parade could leave the royal palace. The high ranking dignitaries with the coronation jewels lined up at the exit of the St. Wenceslas Chapel. 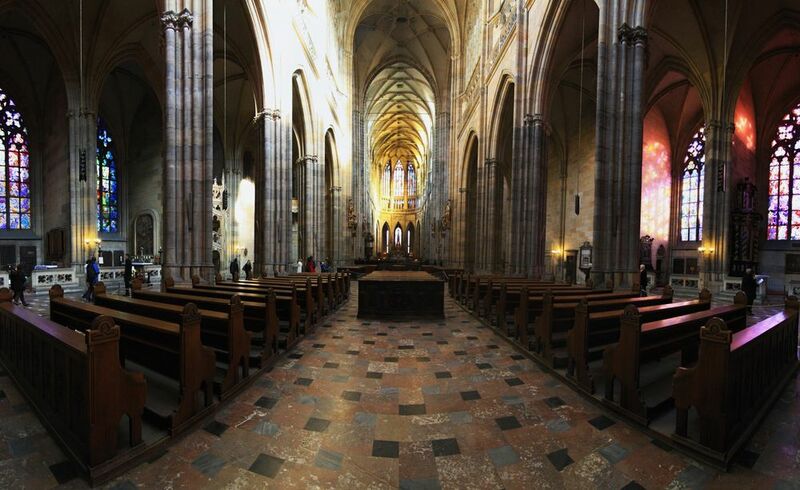 The chapel and the St. Vitus Cathedral were decorated by red and white drapery. After the king had entered the cathedral the priest started to pray and the festive music began to play. The entrusted people gradually started to bring the coronation jewels. The most respected guests were seated in the presbytery behind the altar. After the procession had halted in the presbytery the archbishop uttered prayers after which the king sit on the throne. Then the reading from the Old and New testaments followed. After the music stopped playing the king again moved in front of the altar where he knelt on the faldstool. The new sovereign had to make two oaths. The first oath was in Latin and it concerned the protection of the church and of the real faith. The other one was in German. Then the monarch was festively oiled and he was handed over the insignia of the royal power. Finally the archbishop uttered the final prayer and then the new king festively went out with the sound of the trumpets and drums into the courtyard where he was already enthusiastically welcomed by the citizens.